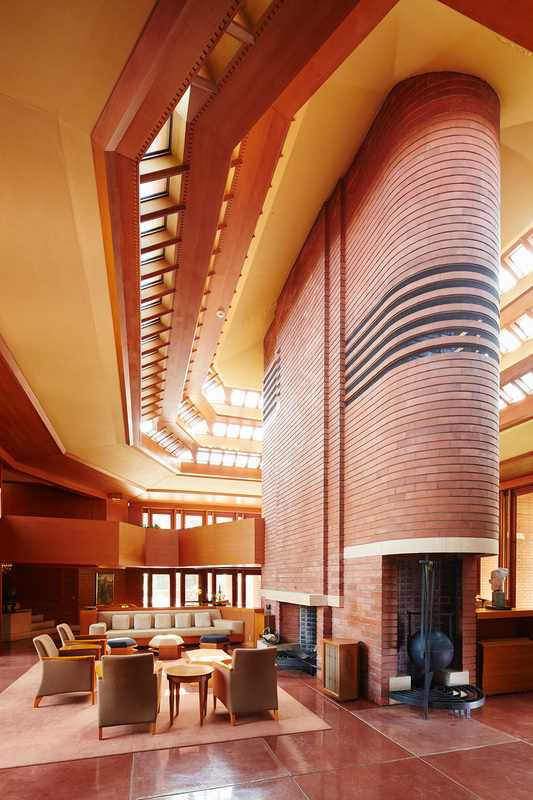 Among Frank Lloyd Wright homes, Wingspread is a 14,000-square-foot masterpiece, commissioned by H.F. Johnson, Jr.
Frank Lloyd Wright called Wingspread “the last of the Prairie houses.” Now the headquarters of The Johnson Foundation. You can still tour it in Racine, Wisconsin. 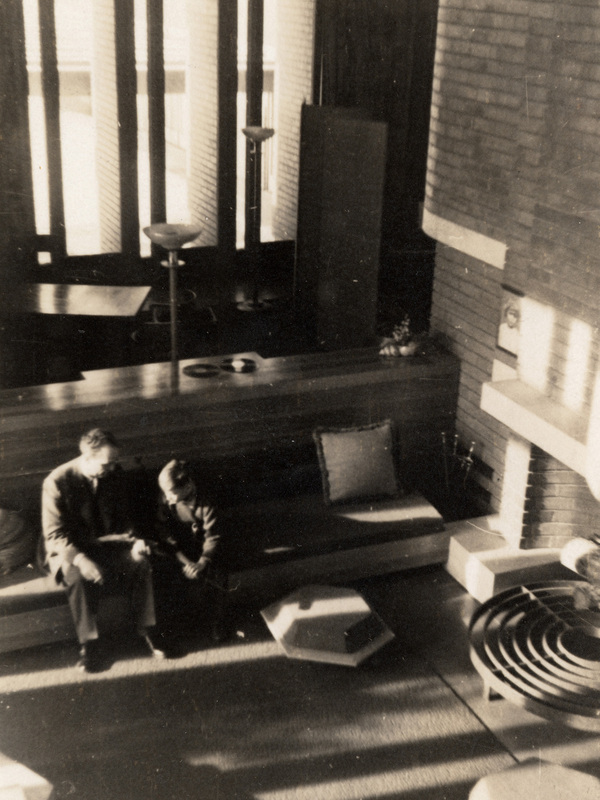 Beyond the Frank Lloyd Wright-designed Administration Building that put our company on the map, third-generation leader H.F. Johnson, Jr. had a personal project underway with Wright too – a new home for his family. 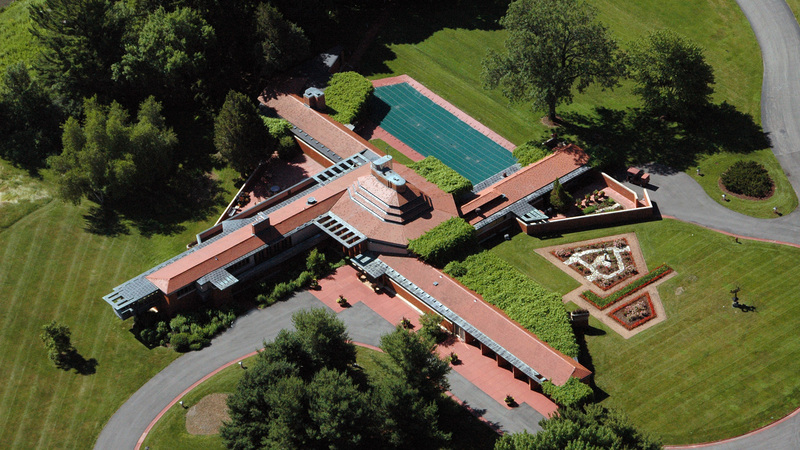 Completed in 1939, the home was named Wingspread. The name Wingspread comes from the home's four wings that spread from its central core living space. Photo: Mark Hertzberg for SC Johnson. During the early 20th century, Wright developed a philosophical foundation for his work based on how people connect with nature. His “Prairie-style” homes bring this notion to life. They are characterised by horizontal lines, low-pitched roofs and materials in accord with local nature. As Wright’s Prairie-style designs evolved, he often planned the living and dining rooms – and other social gathering spaces – as a large, continuing space or “open plan.” This aimed to create a natural flow and to draw occupants out of rooms and into a shared central space. The horizontal lines and unstained wood of Wingspread’s design help it blend with the 30 acres of nature around it. 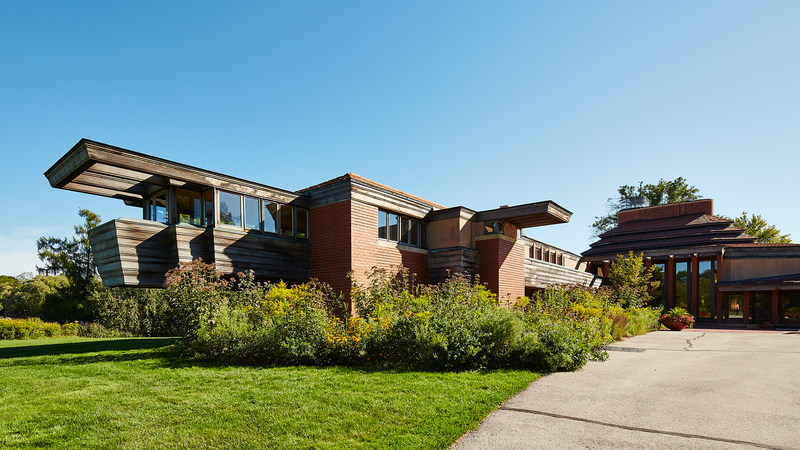 For Wingspread, Wright used Kasota limestone, brick, stucco and unstained wood to help anchor the house to the earth. At the same time, its 30-foot-high chimney and many windows lift it toward the sky. The architecture seamlessly melds into the sprawling prairie, woods and ravines that surround the home. Its remarkable features include its teepee-inspired clerestory ceiling, five fireplaces, the cantilevered “Romeo and Juliet” balcony built for H.F.’s daughter, Karen, and a glass-enclosed “crow’s nest” lookout, from which H.F.’s children, Sam and Karen, could await his return home. LEFT : The core living space, called The Great Hall, soars around a central shaft that houses five fireplaces. Around it is a necklace of skylights that lets in warm light. 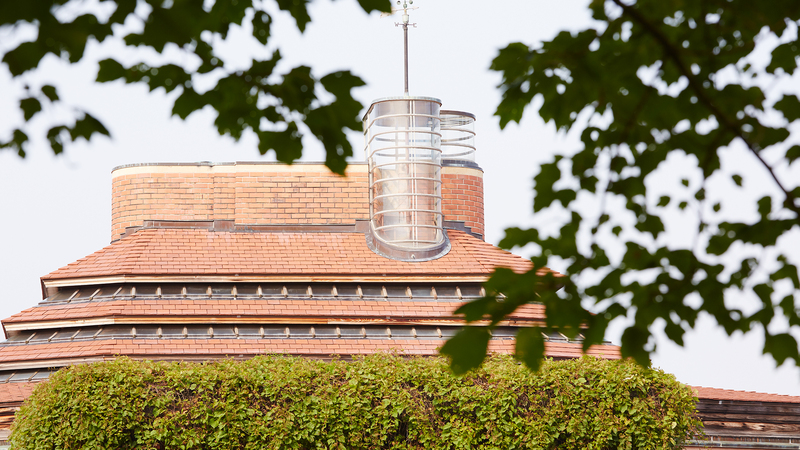 RIGHT : The crow’s nest lookout on the roof of Wingspread is accessed by a spiral staircase. TOP : The core living space, called The Great Hall, soars around a central shaft that houses five fireplaces. Around it is a necklace of skylights that lets in warm light. BOTTOM : The crow’s nest lookout on the roof of Wingspread is accessed by a spiral staircase. A Water Leak and Wright's "Honest Arrogance"
Known for his “honest arrogance,” Wright refused to allow anyone to “tamper” with the designs of Wingspread, whatever the reason. Yet, certain innovations became difficult to live with — something H.F. explained to Wright time and time again. Those exchanges have become legendary, but none as memorable as the tale of the leaky roof at Wingspread. As fourth-generation leader Sam Johnson told the story, at a formal dinner party when he was thirteen years old, a sudden thunderstorm sent a stream of water down on H.F.’s head as he presided over the table. In righteous anger, he put through an immediate call to Wright in Phoenix, Arizona. He told Wright that Wingspread was beautiful, but it had a leaky roof and water was leaking right on top of his head! “Despite such difficulties, for my father, sister and me, it was a happy place to live,” said Sam. H.F. and Sam Johnson at Wingspread. Wingspread was the Johnson family home through the 1950s, and was then donated to The Johnson Foundation to be an enduring source of inspiration as an educational conference centre. H.F. founded The Johnson Foundation to be a convener of experts for positive change leading to healthier environments and communities. Over more than 50 years, Wingspread has hosted hundreds of conferences and been the birthplace of organisations including the National Endowment for the Arts, the International Criminal Court and National Public Radio. In 1989, Wingspread was designated a National Historic Landmark. Wingspread is just five miles north of our campus in Racine, Wisconsin. Plan a visit to see our Administration Building and Research Tower, and add a side trip to Wingspread too. The Johnson Foundation offers Tours that are free and open to the public with advance reservations. 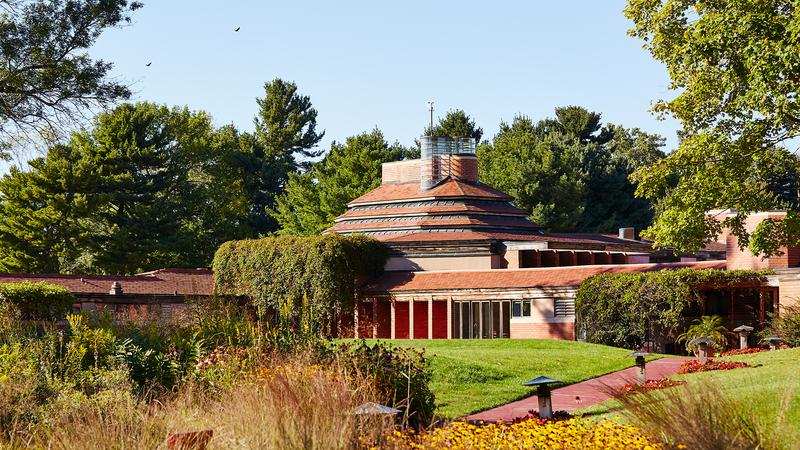 See Wingspread as part of your trip to our historic Frank Lloyd Wright-designed world headquarters in Racine, Wisconsin. Tours are free.